The building was cedar shake, eventually covered in green asbestos shingles. The roof appeared to be regular asphalt shingles. There are four chimneys, two for oil space heaters, one for the kitchen , and one for the massive fire place. The large plate glass window is still intact though about to fall out as the roof over it is collapsing. 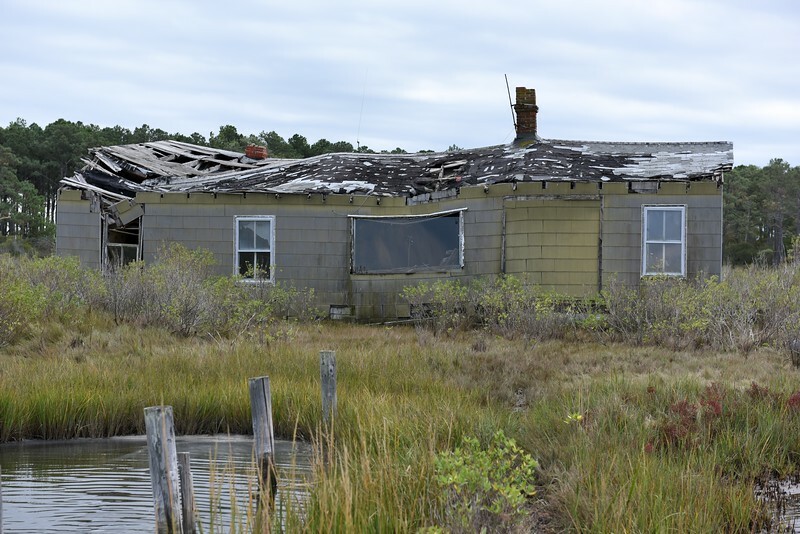 The last year it was used for gunning ( a guess) was probably around 1989 if they took the 25 year option to use offered by the government when Assateague became a National Seashore. Many storms in the last 30 years have washed away all of the out buildings that existed....including an out-house (used by the guides and staff), generator shed, dog pens, decoy and motor shed and a "oyster bar" located at the end of the dock where oysters and booze were enjoyed by the hunters.